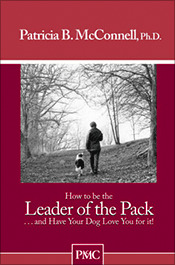 Patricia McConnell | Dog Training Book | How to Be the Leader of the Pack and Have Your Dog Love You For It! If you want to be a natural leader to your dog--like any good parent or teacher--and show your dog that being polite is fun, this pamphlet tells you how to do it in a peaceful, kind way. This concise, 15 page pamphlet gets straight to the point. The ideas and exercises, like “wait at the door” and “four on the floor,” are based on the way dogs communicate with each other, so they are highly effective and easy for your dog to understand. Develop a bond that allows your dog to trust he can count on you when he needs to. If you’re looking for a more thorough training manual, check out The Puppy Primer for dogs under five months, or Family Friendly Dog Training for dogs over five months. Establish lifelong clients by providing effective, science-based training resources along with good medicine. We all know how serious behavioral problems can be--Leader of the Pack is a cost-effective resource to help prevent problems in the years to come. An excellent resource for clients whose dogs are especially pushy, yet need kind and benevolent ways to learn to be patient and polite. "We recommend this invaluable little booklet to pet owners and working dog owners alike." “...Patricia McConnell teaches the humans to teach their dogs. And she does it well.